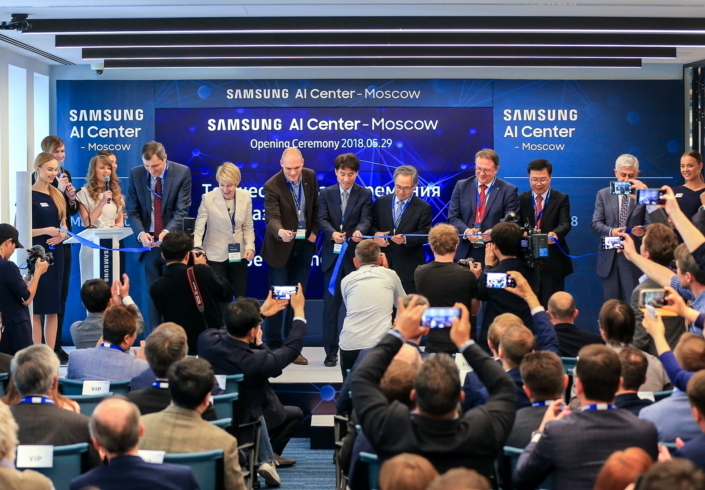 Samsung Electronics today announced the opening of the artificial intelligence (AI) Center in Russia, which will be located in the “White Square” business center in Moscow. The Center will help the company strengthen its leadership in the field of AI and explore the broad capabilities of user-oriented AI. The new Center’s main research areas will be computer vision and basic algorithms for AI platform. The Center will also expand the field of AI for key areas such as robotics, intelligent driving assistance, as well as those for future projects by Samsung. The Samsung AI Center in Russia will be led by Professor Dmitry Vetrov of the Higher School of Economics (HSE). With a Ph.D. degree in Physical and Mathematical Sciences, Vetrov is also the Head of Samsung’s laboratory at the Center for Deep Learning, and Bayesian Methods Research Group at the HSE. 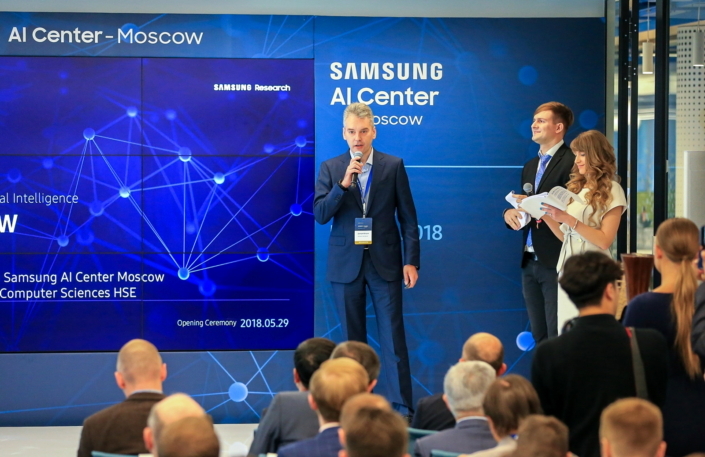 Professor Dmitry Vetrov, the leader of Samsung AI Center Moscow, is delivering an introductory speech at the opening, May 29, 2018. As the leader of the Center, Professor Vetrov will combine scientific work and administrative activities: interacting with Samsung’s divisions and third-party institutions, organizing the Center’s overall work, managing work groups, as well as controlling and participating in scientific research. Professor Viktor Lempitsky of the Skolkovo Institute of Science Technology will also join the team as the leader of the research group. While there currently are several joint AI laboratories at Moscow State University, the Higher School of Economics and the PDMI RAS, the new Center will establish additional joint labs with Russia’s leading universities. In addition, Samsung will conduct projects with the local universities and different regions of Russia including Kazan, Samara, Rostov-on-Don, Tomsk, and Novosibirsk. Considerations regarding cooperation with Russian start-ups to solve practical problems are also under discussion. Moving forward, these can be developed into full-fledged services related to AI and machine learning, as well as promising developments in the field of applications and components for the company’s products. “Samsung plans to introduce AI technologies to all of its connected devices and services by 2020. AI will enhance our customer value by offering information and services under any circumstances,” commented Jin Wook Lee, the Head of Samsung R&D Institute Russia, at the opening of the new Center. “This will be a huge step for the world of technology, and will help simplify the implementation of everyday tasks,” he added. As the popularity of Internet of things (IoT) devices grows, the area of application of AI-based solutions is expanding rapidly. According to the forecast of Samsung experts, IoT devices with built-in AI will generate enormous amounts of data in the coming years. By processing this information, the devices will be able to provide maximum personalization and full compliance with the users’ needs. “Currently, AI is one of the most promising branches of technology. The opening of the Samsung AI Center in Russia will allow us to contribute to the development of the industry and to apply the achievements of the Russian mathematical school, which has a high level of practical training of research specialists,” said Professor Vetrov. Earlier in May, Samsung has opened two new AI Centers in Cambridge (UK) and Toronto (Canada). More information about Samsung AI Center in Russia and global AI Centers is available at Samsung Research website.